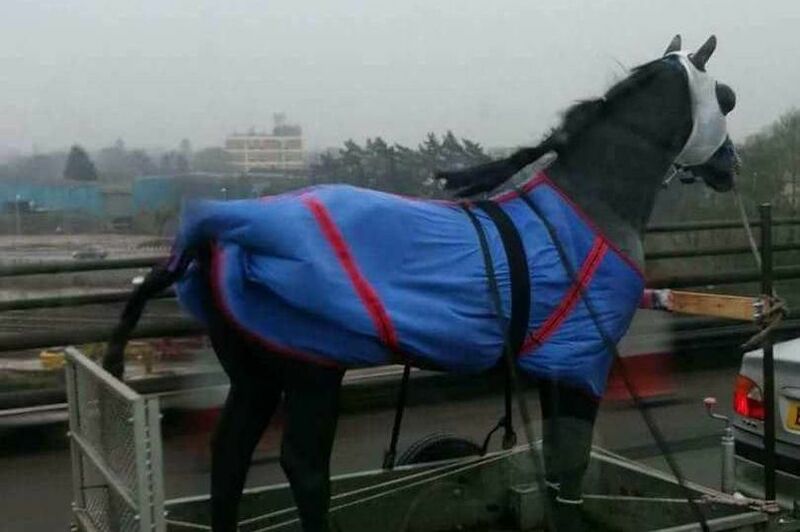 You can understand why motorists called the RSPCA after seeing this “horse” being driven along in a flatbed trailer! I came across a pretty amusing news article the other day. The RSPCA received a bombardment of phone calls about the cruelty of a horse that was being transported on a trailer. No horsebox, just a rusty old flat bed trailer. Angry motorists rang in to report the endangered horse. Luckily, the culprit of the animal cruelty turned out to be a pretty nice couple who were transporting their fake plastic horse from Birmingham, back to their home in Cambridge. Phew! Perhaps motorists thought the poor horse was heading up to Newmarket in preparation for the 1000 Guineas! I actually pass a life-sized model of a horse every day on my way to the barn. The people who own it move it around it’s paddock periodically and dress it according to the weather. The first time I saw it, I certainly did a double take. The scary part is that some people actually do put their horse on a flat bed! The video below is a real horse!! This is not a plastic horse. Hard to believe that someone would do this. The horse seems pretty sanguine about it. Click on the photo to watch the video. Yea, a few people really do put their horse on a flat bed.. kinda scary.